The Avon Marching Black Gold’s fire-themed show “Drawn to the Flame” definitely drew in the audience, which broke out in cheers Saturday night at Lucas Oil Stadium. Yet it wasn’t enough to win over the judges at Music For All’s 2014 Bands of America national championship. The metro-area high school band was awarded third place in the finals, behind two out-of-state rivals. First place went to the Tarpon Springs Outdoor Performance Ensemble of Tarpon Springs, Fla., which garnered 97.15 points with its show, “Man vs. Machine.” The band also received awards for Outstanding Music Performance and Outstanding General Effect. Coming in second place was the Broken Arrow Band of Broken Arrow, Okla., which received 97 points points with its show “Face Me” and also was awarded Outstanding Visual Performance. Their third-place finish came after the Avon Marching Black Gold seized the Class A state title last week, its 11th state title in 14 years. Nonetheless, band members cheered when they heard their score Saturday night. “We were really proud of our performance,” said junior Hannah Wolfinbarger, one of the drum majors. Avon was one of three metro-area high school marching bands named finalists. 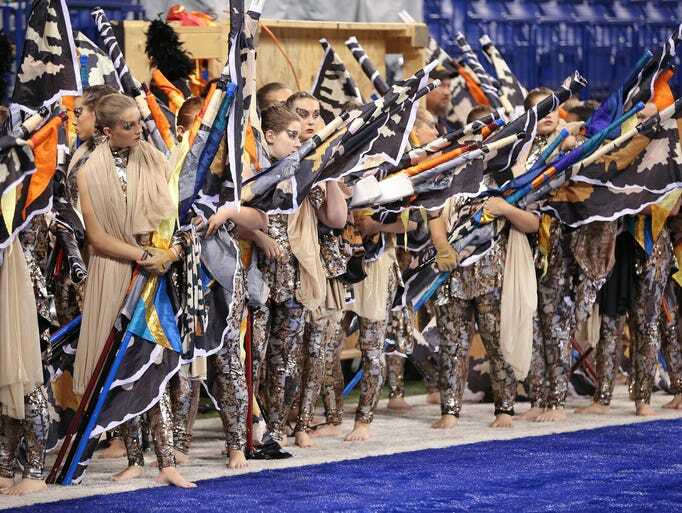 Carmel High School’s Marching Greyhounds and Marching Pride of Lawrence Township also were among the top 12, as well as the Homestead Spartan Alliance Band of Fort Wayne. Carmel took fourth place with 94.9 points for its gypsy-themed show called “In the Cards,” loosely based on the lives of caravan travelers in the desert. The show explored the themes of love, death and destiny. The Marching Greyhounds played original music composed by former band director, Richard Saucedo, Michael McIntosh and Jeff Queen. One of the highlights of the show was a juggling feature by senior Jack Denger, one of the drum majors and a world-class juggler. Denger, 17, won the junior division of the International Juggler Association’s contest in June. He put his skills to the test on the field this season in the fifth and final movement of Carmel’s performance, flipping red-and-white pins while standing on a tarp designed like a Magic 8 ball. The color guard surrounded the Magic 8 ball, tossing their rifles, as the horns blasted and the beats of the drum line ricocheted across the stadium in Downtown Indianapolis. For Denger, there is no better feeling than moments like those, where the nearly 250-member band performed in sync. The Marching Pride of Lawrence Township band placed 12th with 86.45 points. Still, it was a year of firsts for the new ensemble. The marching bands for Lawrence North High School and Lawrence Central High School were consolidated into one band before the start of the school year. Quentin Beverly, one of the drum majors, said he had high hopes for the new ensemble from the start of the season. “I saw a lot of potential for this band,” said Beverly, a senior at Lawrence Central High. The band took the field with its theme, “The Green Table,” based on the 1930s play by Kurt Jooss about the failed peace negotiations before World War II. Right in the middle of the field is a green table that the band matches around. Call Star reporter Steph Solis at (317) 444-6494. Follow her on Twitter: @stephmsolis. Three local marching bands have made it to the final round for the Music For All’s 2014 Bands Of America national championship. The judges named the Avon Marching Black Gold, Carmel High School’s Marching Greyhounds and Marching Pride of Lawrence Township as finalists. The Homestead Spartan Alliance Band of Fort Wayne also also was among the top 12 high school marching bands from across the country who competed in the finals. The show featured four songs: “SerenadaSchizophrana” by Danny Elfman, “Symphonic Metamorphosis, Movement Three” by Paul Hindemith and “Wild Nights” from “Harmonium” by John Adams. There also are several solos and a flute and clarinet duet at the beginning. Avon Band Director Jay Webb said the band’s theme this year has been challenging to pull off, especially as the cold set in this week. Carmel High School’s band performed a gypsy-themed show called “In the Cards,” loosely based on the lives of caravan travelers in the desert. The show explores the themes of love, death and destiny. Carmel was in good spirits after the semifinal performance. Director Chris Kreke said was confident that the band would make the finals. “I thought they were fantastic today,” he said. The accolades come as little surprise for Avon and Carmel. Avon seized the Class A state title last week, its 11th state title in 14 years. Carmel was the Class A runner-up this year and has won three in the past 14 years. But for Marching Pride of Lawrence Township, Saturday night’s appearance in the national finals marked a special milestone. This year, the marching bands for Lawrence North High School and Lawrence Central High School were consolidated into one band before the start of the school year — the 250-member Marching Pride of Lawrence Township. Quentin Beverly, one of the drum majors, said the groups got along, but it was difficult to combine their traditions and legacies. Still, he said, he had hope that the band would shine this season. Megan Ellsworth, a drum major from Lawrence North High, said she couldn’t see the combined band making it this far in the Grand National Championship, but the group came together and worked through its first season. The winner will be announced shortly after 11 p.m. Saturday.